The combination of different, already existing CAD functionalities will, in future, also allow more complex partial prosthetic restorations to be fabricated using computer-aided technology. Gaps in the manufacturing side must be closed and individual modules adapted to provide a continuous workflow according to dental technology logic. However, the basic functions already exist, including the newly developed algorithms for full-denture prosthetics. In the “Removable restorations 2.0” series, Dipl.-Ing. Ineke Knill and Dipl.-Ing. Falko Noack (both AG R&D Department), explain which complex types of restorations are fundamentally suitable for digital fabrication in future using the Ceramill system, and outline the possible approaches and process stages using fictitious cases. Edentulous upper jaw, denture comprises primary and secondary crowns on 13, 23 and 26, a CrCo framework as connector, denture saddles, denture teeth and veneering of the secondary crowns. Existing scan strategies for die model models with opposing dentitions and articulator position transfer will be used for the scan process. The telescope crowns will be designed using the telescope module. This has been used successfully in the daily laboratory routine for a number of years. 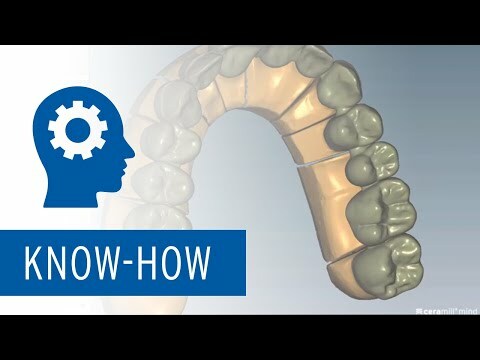 The existing crown and bridge module will be used for the secondary crowns to design vestibularly reduced crowns with connection geometries for attaching to the CrCo framework. The porcelain facings can be planned in the form of veneers. The CrCo design will be created using the existing software. The challenge is that the denture element design should be completed in a common workflow. This requires the named CAD modules to be combined in a single software and closely linked. The full-denture prosthetics module functions can be used for setting up the denture teeth and designing the denture saddles. Positioning and adaptation option requirements are the same as described in Case 1. The following important components of the full-denture prosthetics module will also be used: denture teeth and blanks, creation of gingiva sections, which take into account the set up denture teeth with cavities. The teeth are not only adapted basally and occlusally. The set-up area limited by the residual dentition first requires proximal adaptations of the teeth. Digital adjustments undertaken in the proximal area can be transferred to the actual denture teeth in the same way as occlusal and basal reductions using the denture tooth blank. The relevance of model analysis and coordinated occlusal concepts are not as significant with this denture – the position of the denture teeth is relatively clear based on the prescribed position of the prepared teeth and opposing dentition. Links still have to be created and individual modules adapted to these requirements to ensure a continuous workflow according to dental technology logic to enable fully digital fabrication of these types of restorations in future. Furthermore, production-related gaps must also be closed to provide dental technicians with an integrated system solution.